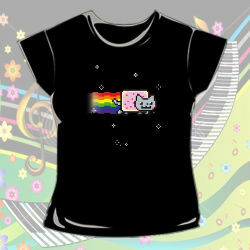 Nyan Cat Clothes. . Wallpaper and background images in the Nyan Cat club tagged: nyan cat nyan cat clothes shirt. This Nyan Cat photo contains 球衣, t恤, t恤衫, 泽西岛, and t 恤. There might also be polo衫, 运动衫, polo 衫, 运动衬衫, 长袖, and camise.